THE SCOTTISH scourge of Trump supporters; exposer of the hypocrisy of Alt-Right 'free speech’ advocates; an inveterate Tweeter; a star of TV, Vine, and webcams; author of “daft wee stories”; a phenomenon - Limmy is a Renaissance man of modern Comedy. However Limmy has never been to Ireland. “Not even on a holiday, and it’s just across the water!” he says. That changes this summer when he arrives in Galway for a night of storytelling, chat, comedy, and readings from his new book, That’s Your Lot. That’s Your Lot, published by HarperCollins, is Limmy’s second short story collection, following 2016’s bestselling and critically acclaimed debut, Daft Wee Stories, but the Scot has something quite different in store for readers this time around. 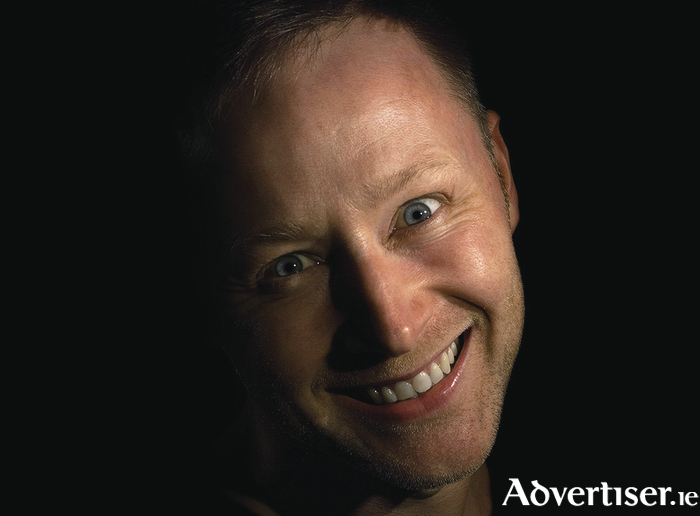 Limmy adds, “I don’t know what people will think," about this new approach, but forearmed is forewarned, hence the book’s stark black cover and photo of Limmy wearing a deliberately unhinged smile. “That’s me trying to get it across to folk not to expect the first book,” he says. Limmy’s rise to comedy prominence did not come through the usual route of treading the stages at comedy clubs and festivals. Instead Limmy arrived, first through his daily podcast, Limmy's World of Glasgow, in the early/mid noughties, through videos on Vine, an active Twitter account which today boasts 275,000 followers, and TV, such as Limmy's Show for the BBC, which earned him a Scottish BAFTA, as well as appearances on The IT Crowd and Charlie Brooker's News Wipe. From this he has become a major draw at large venues across Britain and Ireland. Given Limmy is highly ‘cross-platform’ in his approach, concentrating mainly on digital media and television, what was the attraction of writing a book, and thereby ‘going analogue’ in embracing traditional media? “I wrote this story on Facebook and on my blog,” says Limmy. “The publisher got in touch, asking would I be interested? ‘Oh aye, definitely!’ So I wrote a story every night when the whim took me, or when it popped into my mind - just seeing what would happen. I never thought to myself about writing a book. Limmy - real name Brian Limond - was born and raised in Glasgow, and while thecity is often seen as having its own, individual sense of humour, Limmy attributes it more to life circumstances and experiences, rather that a consequence of being from the city itself. “You get people talking about the Glasgow sense of humour, that it’s dark, but every city and town says ‘There’s naebody like us!’" he says. “At Christmas, a man dressed as Santa Claus and was arrested by the police, and people were saying, ‘Only in Glasgow would that happen!’ so I did a search on Twitter for ’Santa arrested’ and found Santas arrested in San Francisco and Norway, so, much as I’d like to say that Glasgow’s sense of humour is very dark, and you don’t get it anywhere else, you do get it in other places. Everybody’s the same and everybody’s different. Limmy’s 2017 got off to a controversial, and perhaps un-nerving, start. On January 20, the day of the inauguration of Donald Trump as 45th president of the United States, Limmy tweeted 'Looking forward to Trump’s assassi… inauguration’. Cue 2,0262,026 retweets and more than four million likes. Yet what was obviously a humorous and mischievous Tweet was taken as deadly seriously by some of Trump’s more zealous supporters, many of whom sent it to the FBI's official Twitter handle, while one, under the moniker of Agent Ice tweeted to Limmy that he must "NEVER travel to the USA; the NSA, CIA, FBI, Secret Service and all law enforcement has you under surveillance." “I like winding people up,” Limmy admits, “but at the back of my mind, I was thinking, ‘Am I going to get door stepped by a nut job and shot in the face?’ But you can’t think about that, you just have your joke. Not to get too political or anything, but these alt-Right people especially, they go on about how the left has stopped free speech and expression and that they can’t take a joke, that they’re snowflakes, and that you should be able to say what you want, then I say one thing about Trump and all these folk, who have all this about free speech in their Twitter bio, are copying my Tweet and tagging the FBI, and saying, look at this, this is terrible! Limmy: That’s Your Lot is at the Black Box Theatre on Friday June 2 at 8pm. This is a ‘Róisín Dubh Comedy presents…’ event. There will be a Q&A and book signing as part of the show. Tickets are available at www.roisindubh.net, the Ticket Desk at OMG Zhivago, Shop Street, and The Róisín Dubh.